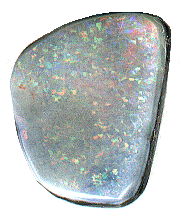 Cutting through a thin layer to expose greater fire is a common challenge when carving opals. I had an opal in my scrap box for years that didn’t interest me. One day, after a close inspection, I saw a red broad flash under the pinfire. I didn’t much care for the stone as it was, so I decided to cut it deeper. The picture below shows the stone when I started. The top has been sanded to show fire. 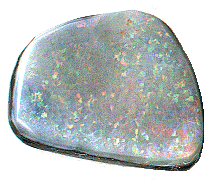 At this stage, the opal weighed 6.51 carats. It had no tapering on the sides, and the back wasn’t sanded. There was a half-carat waste in shaping this stone, so its maximum size potential was about six carats.